New to the team this year, 32-year-old Eddie Troconis knows the importance of education. Troconis, the lead engineer on the No. 6 College Complete (http://www.collegecomplete.com or 877-543-2655) Chevrolet at Eddie Sharp Racing, holds not just one, but three degrees, all earned in order to achieve his career goals of working for a top NASCAR team. I love working in racing and my degrees definitely helped me learn new ways to apply computers and technology to it. A native of Mexico, Troconis has an impressive racing resume of his own, including starts within the NASCAR Nationwide Series, before turning into a full-time mechanic and race engineer. He credits his position to his education, as he holds a degree in Mechanical Engineering, Business Management, and a Masters degree in Marketing. Though he began his career in motorsports as a driver himself, his education opened doors for him beyond turning the wheel of a race car. After earning his degrees, Troconis became one of the most sought after engineers in the garage area. The engineer at a race team provides valuable information, including key ideas on the setup, various race strategies, fuel mileage, and other key tips that help a crew chief navigate through a race weekend. Troconis has experience as a driver, crew chief, and engineer, as well as expertise in building, tuning, and servicing the shocks. He also plays a key role in assisting in general mechanic duties on the No. 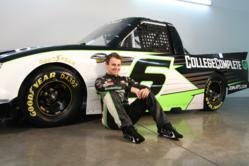 6 College Complete Chevrolet during any given race weekend. Though race engineers may get a reputation for being computer savvy, successful engineers like Troconis must also have the ability to communicate well with others, showcase strong leadership skills, not buckle under pressure, and be willing to assist when necessary. Like Troconis, it takes a strong will and determination to reach the upper levels of NASCAR, and hands-on experience and training is the best way to the top. Troconis embodies those traits, and through his pursuit of a long and successful career within motorsports, he has built a strong and lengthy resume. From his days of racing go-karts for his family-owned team, to working for some of the most competitive NASCAR teams spanning the Camping World Truck and Nationwide Series, most recently with Eddie Sharp Racing and Kevin Harvick, Inc., Troconis is a great example of the many career opportunities that can come your way through education. For more information on how you can pursue a career within motorsports like Eddie Troconis, check out http://www.collegecomplete.com or call 877.543.2655 to find a program that best suits you and your needs!